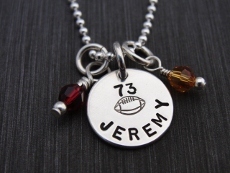 A sterling silver disc is stamped around the bottom with a name and/or jersey number. Then your favorite sports stamp is stamped in the middle of the disc. Add beads to reflect school colors or birthstone. The discs are hung on sterling silver ball chains which come in 16", 18", or 20". 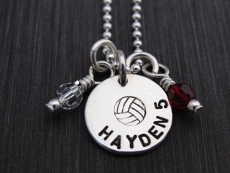 To order this item, please select a style, chain length, enter name and or jersey number, sports stamp and beads. Then click the Add to Shopping Cart button. Hip Tip: Are you a proud parent with a son or daughter in a sport? Show your support with the Sports Necklace.